The belated introduction of backwards compatibility to the Xbox One won’t just allow you to play Xbox 360 games on Microsoft’s newer console. It’ll allow you to use your old save files, too. To get that feature to work, you’ll have to transfer your 360 saves to the cloud. It’s easy, so long as so you still have access to those saves on an Xbox 360. It’s also something more and more gamers will be doing as Xbox 360 classics including several remakes of Rare games and the entire slate of Gears of War games become available to play on Xbox One, with many more to follow when the feature launches for all Xbox One users in November. Your Achievements in any backwards-compatible game are yours forever and therefore carry over without you doing anything. Technically, they were already there. This does not mean your saves automatically carry over. Those only do if you had originally saved your Xbox 360 game’s saves data to the cloud. If you did, disregard the rest of this guide. The Xbox One will sniff out your saves when you start your 360 game and will inform you that it is syncing your data. All done! While we have not run into any instances where you can’t move your saves into the cloud, we have seen instances in the past when some publishers blocked the copying of saves on, say, a small number of PlayStation 3 games from one PS3 to another. In those cases it was a publisher decision, and it would be surprising to see that be an issue with many, if any, 360 games, especially given how the save-transfer process below really just involves putting 360 saves into official Xbox 360 cloud storage, a feature that should work for any game. Xbox One Backwards Compatibility is currently active for users of the console’s preview program. A list of supported titles can be found here. Prior to the full November launch of the feature for all Xbox Live members, backwards compatibility can be used on a case-by-case basis, such as using it on the Rare games included in Rare Replay or for any Gears of War games for purchasers of the Gears of War remake. Most 360 gamers probably saved their games on the console’s hard drive or even on USB storage. That’s what I generally did and had to poke around a little to get them onto my Xbox One. I recently ran through this process using the Xbox 360 version of the game Banjo-Tooie. Just to set things up, here is the game running on my Xbox One. As you can see, I have no save progress. This is the problem I needed to solve! Step 1 - Make sure you have a 360 save file. 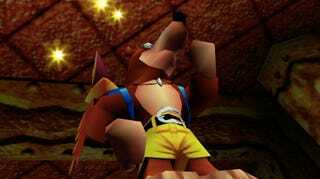 I hadn’t played any Banjo-Tooie on my 360. I bought it to have ready for whenever I finished playing the remake of its predecessor, Banjo-Kazooie. I wanted to show this save-transfer process, though, so I played a little of Tooie on my 360. I played enough to get a save about six minutes in. Step 3 - Copy or move your save and profile data to the cloud. Your games may have multiple files associated with your profile. Put all of it in the cloud. Note that 360s are tied to a 512MB cloud storage limit per user. The Xbox One storage limit is effectively unlimited, but it will only be able to pull from the 360’s 512MB allotment. The 360 helpfully indicates how much room it has left in the cloud, so you can easily tell how much you can load up in one go and how much you need to clear out if you need more space. UPDATE - 12:54pm: To be clear about this, if you ever remove a 360 save file from your 512MB Xbox 360 cloud storage, you won’t be able to access that save from your Xbox One. *Some save files won’t “copy” over. This happened to me with my Viva Piñata saves. Don’t worry. I was able to “move” them. Try that. Step 4 - Let your Xbox One find your saves. You are pretty much done. Try running your 360 game on your Xbox One. As long as you are logged in to the sale Xbox Live profile it will grab your data from the cloud and notify you that it is syncing it. If it notices a discrepancy between any existing save progress that you already have on your Xbox One, it will ask you which file you want it to use. Bonus fact. It works both ways, meaning that your 360 will sync any save progress that you make while playing a 360 game on an Xbox One. That’s happening in the shot above as my Xbox 360 registers that I made progress in Perfect Dark while playing the game on my Xbox One. It makes sense that this happens in both directions, since the Xbox One’s backwards compatibility feature basically just has the Xbox One pretending to be an Xbox 360.